1. Time to deal: United Technologies (UTX), a conglomerate that makes equipment for the aerospace and building industries, has announced plans to buy high-tech aerospace and defense electronics supplier Rockwell Collins (COL) for $23 billion. The combined company would have annual sales of around $34 billion, making it the world's fourth largest aerospace firm by revenue after Boeing (BA), Airbus (EADSF) and Lockheed Martin (LMT), according to industry website Flight Global. A second major transaction was announced in Europe. French industrial firm Schneider Electric is paying shareholders in Aveva £650 million ($840 million) in a deal that will see its software division folded into the British engineering company. Schneider will receive a controlling stake in Aveva, which will remain listed in London. Shares in Aveva gained over 24%. 2. NAFTA talks: The second round of NAFTA renegotiation talks will wrap up in Mexico City on Tuesday. While Mexican and Canadian leaders said they're interested in "modernizing" the agreement, President Trump is seeking significant changes. Trump has repeatedly threatened to withdraw from the agreement, which he considers unfair. About 14 million American jobs depend on trade with Mexico and Canada, and billions of dollars of goods cross the borders each day. 3. Layoffs at Lego: Lego announced plans to cut roughly 8% of its workforce -- 1,400 jobs -- as part of an overhaul aimed at simplifying its structure. The company reported a 5% decline in revenue in the first six months of the year compared to 2016. 4. 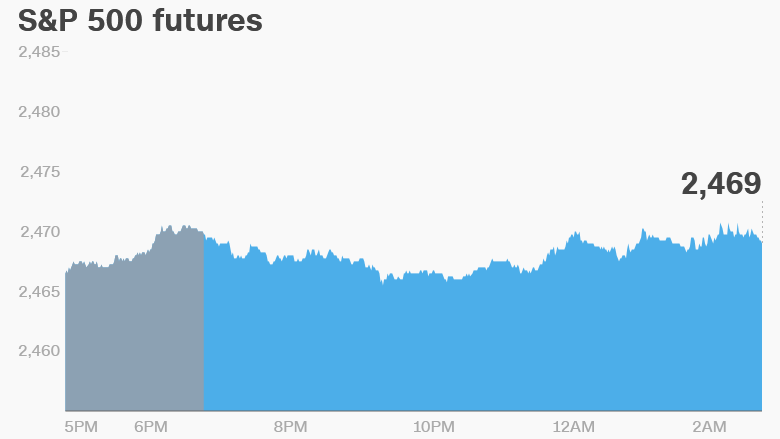 Global market overview: U.S. stock futures were lower on Tuesday as investors returned from a holiday weekend. European markets opened higher, while Asian markets ended the session mixed. The Dow Jones industrial average and the S&P 500 gained 0.2% on Friday, while the Nasdaq added 0.1%. 5. Companies and economics: Dave & Buster's (PLAY) and Hewlett Packard Enterprise (HPE) will release earnings after the closing bell. Rovio, the Finnish company behind Angry Birds, has announced plans for an IPO in Helsinki. The U.S. Census Bureau will release its Factory Orders report for July at 10 a.m. ET.